If you're anything like me in your preference for gentle daily cleansers, it's a good idea to do a weekly exfoliation to slough off dead skin cells, keep your skin's tone and texture even, and help lotions absorb better. That's where a product like Dr. Brandt Microdermasion Exfoliant ($90 at London Drugs) comes in handy. The formula—which happens to be a former Allure magazine award winner—combines lactic acid and micro-scrubbing crystals to give you the effects of a professional procedure, but with the convenience and affordability of an at-home treatment. This is hands down one of the most effective exfoliants I've tried, which is good and bad. If your skin is sensitive, I recommend leaving this mask on for a shorter time (around 1 minute) and using the lightest pressure possible when massaging the crystals on the skin. In fact, after about 45 seconds of ultra-gentle massaging, my face was tingling so much I stopped and let the lactic acid work its magic for the next 45 seconds. The result was a smooth, glowing complexion sans irritation. 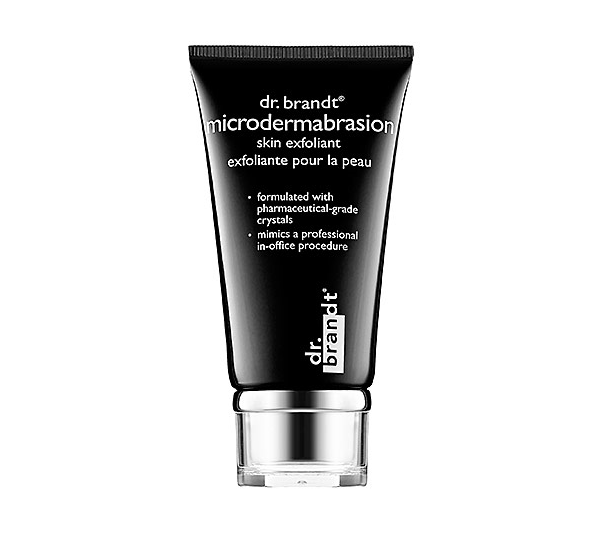 Dr. Brandt Microdermabrasion Exfoliant is indeed a winner, but you'll have to follow instructions carefully and proceed with caution.